Obtain high performance, convenience, and flexibility by using our top-of-the-line IC platform optimized for capillary flow rates. The Thermo Scientific™ Dionex™ ICS-6000 Capillary HPIC™ System enables you to scale down column size, injection volumes, and flow rates by a factor of 25 to 100. With a capillary configuration, your system is always ready and able to run samples 24/7 with minimal calibration and equilibration time. These systems combine the all the advantages of high pressure ion chromatography and capillary IC. They are available in three configurations to match your application requirements. Get best-in-class resolution, sensitivity, and throughput for even the most complex ICxIC (2D-IC) methods and trace level analyses. The versatile Thermo Scientific™ Dionex™ ICS-6000 Hybrid HPIC™ Systems provide faster separations without compromising resolution, thanks to its dual high-pressure channels. One channel is optimized for capillary flow rates, while the other is optimized for standard (4mm) or microbore (2mm) mode. 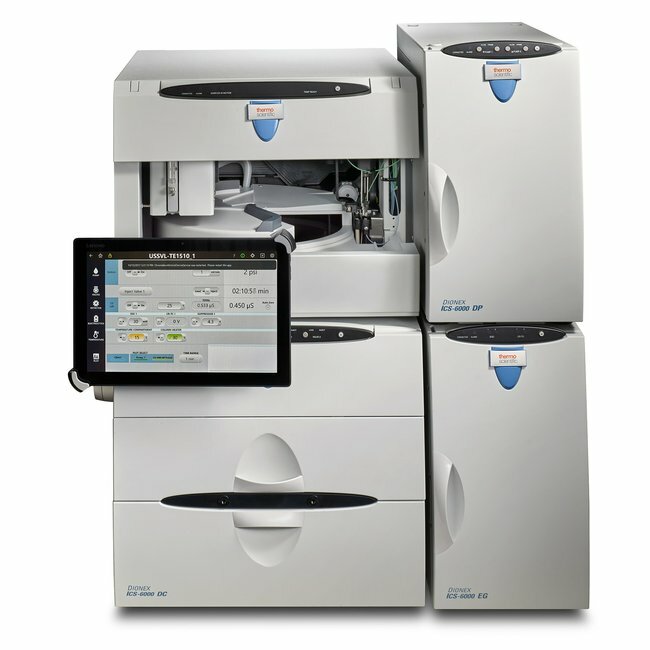 You’ll save time and improve reproducibility with precise, automatic eluent generation and sample preparation. Choose from a wide variety of chemistries, detectors, and automation options to fit your needs.